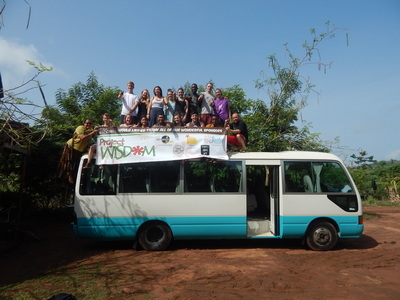 It's the classic climb the bus group photo. 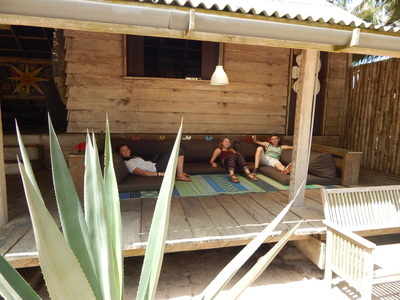 Zoe, Jill, and Brendan relax on the porch at One Love Foundation. 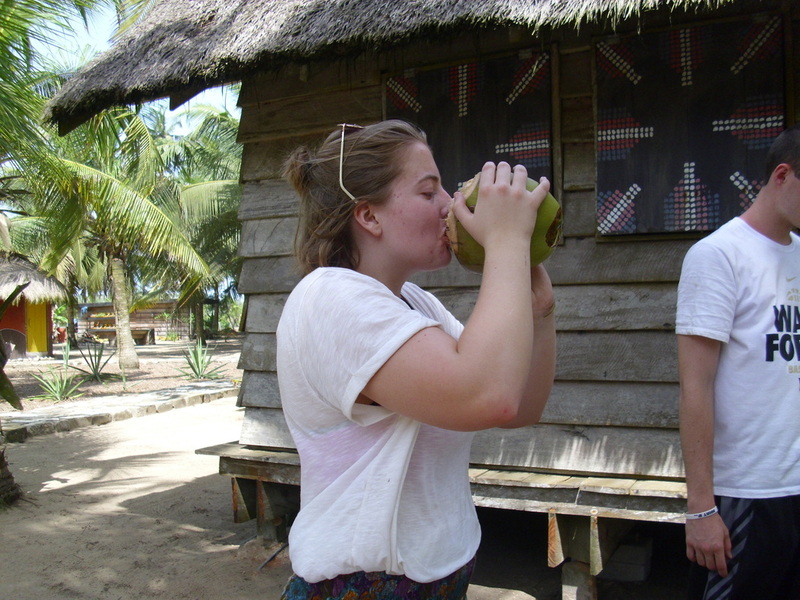 Emma tries fresh coconut juice at One Love Foundation. Outside of Fort St. Jago in Elmina. Kindergarten at the Asaafa Primary School. 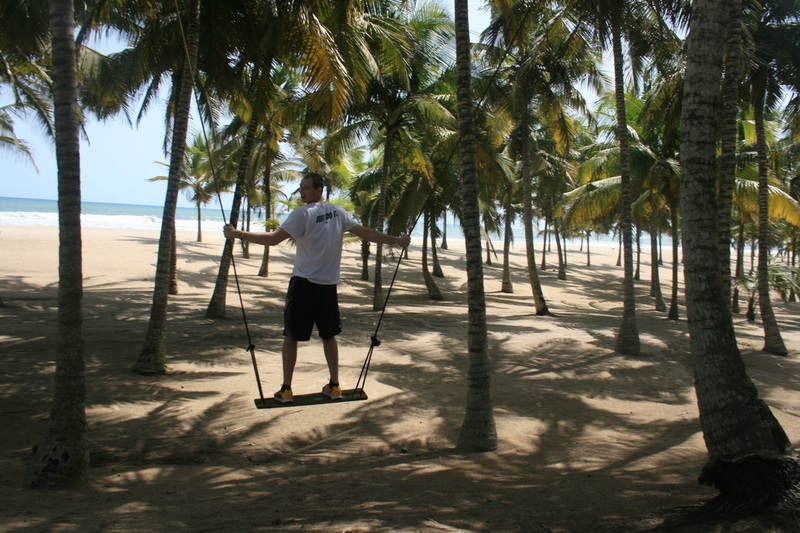 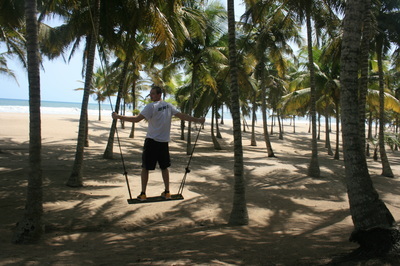 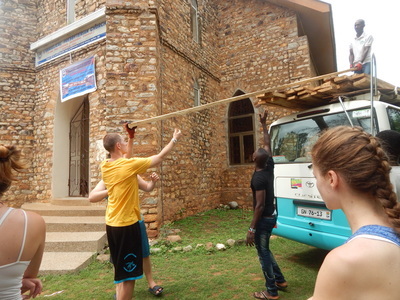 Giant swing at One Love Foundation. 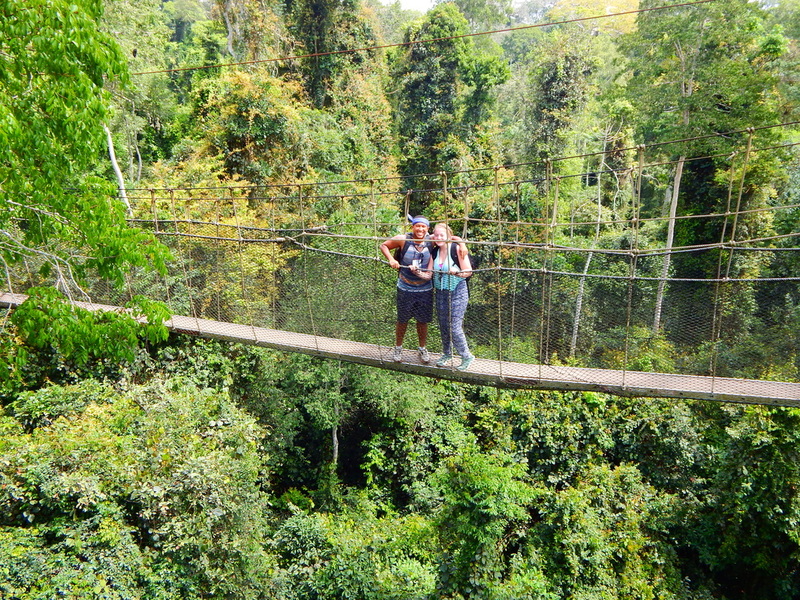 Kakum National Park - canopy walkway. 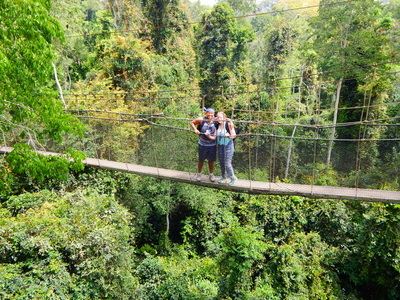 Caleb and Emma pose for a picture 120 feet above ground. 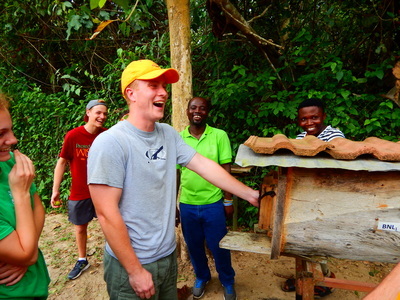 Noah (who is afraid of bees) at the Stingless Bee Center. 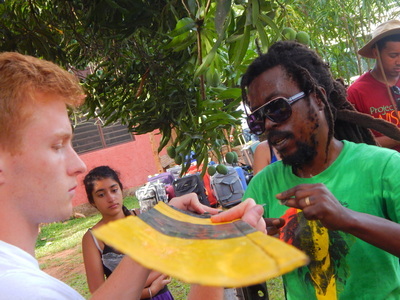 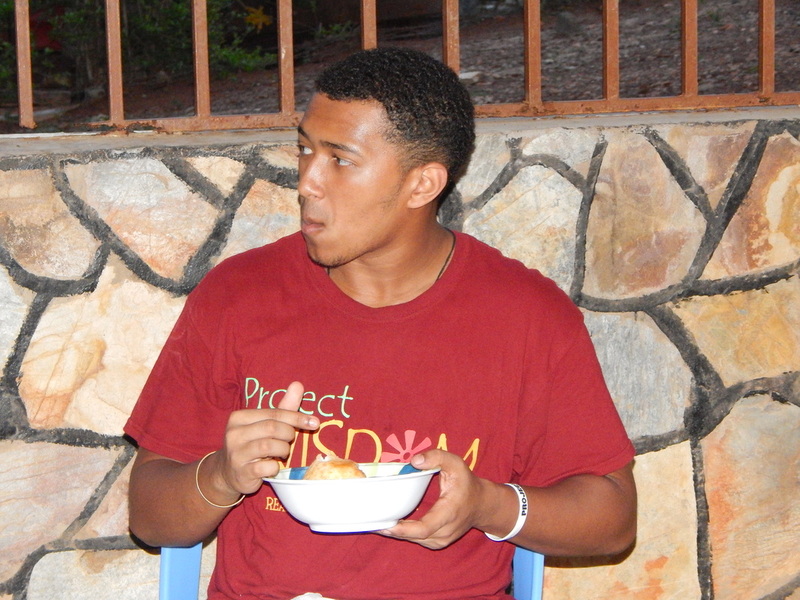 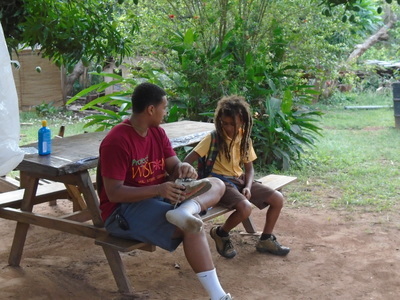 Caleb talks with his new friend in Peki. 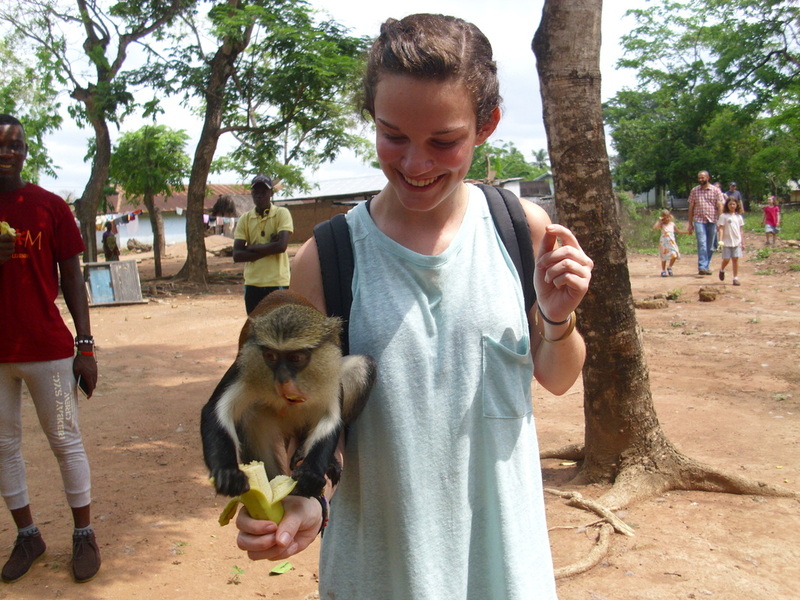 Genna feeds a monkey at the Tafi Atome Monkey Sanctuary. 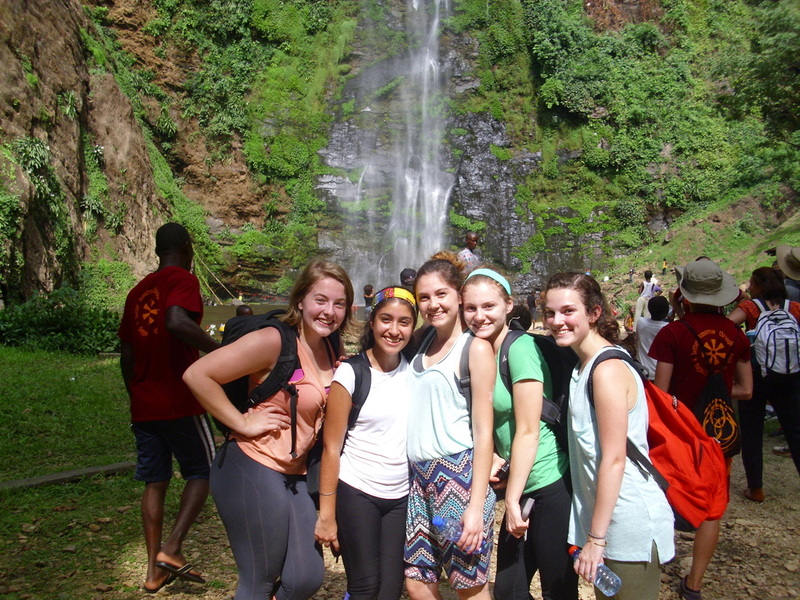 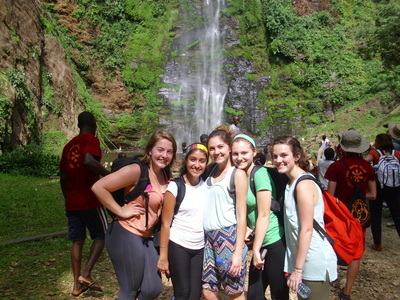 Group picture in front of the beautiful Wli Falls. 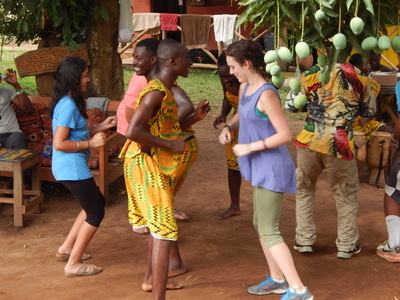 Caleb learns a traditional Ghanaian dance. 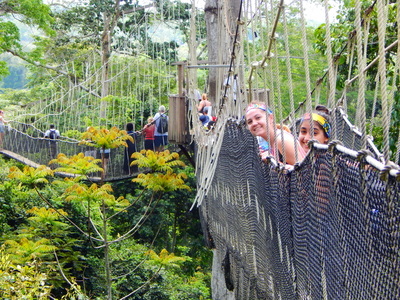 Genna and Anuva join the fun. 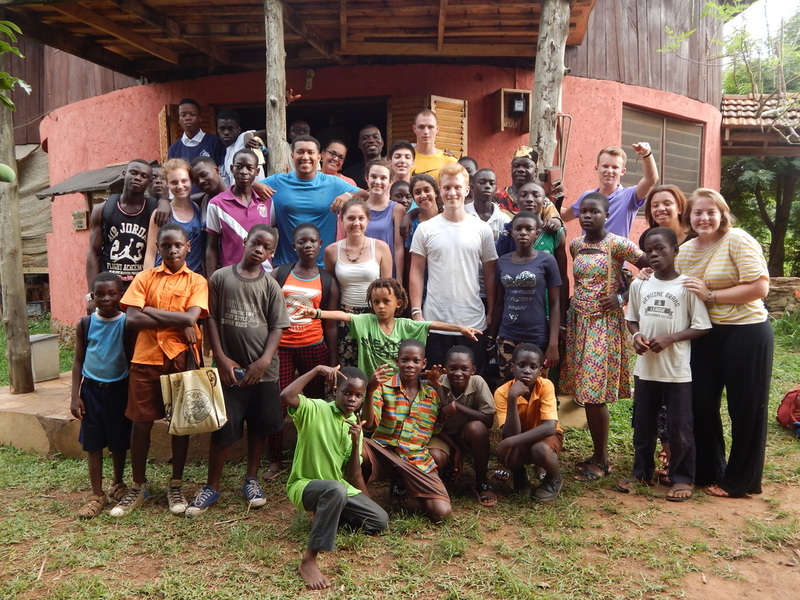 Saying goodbye to Roots Yard. 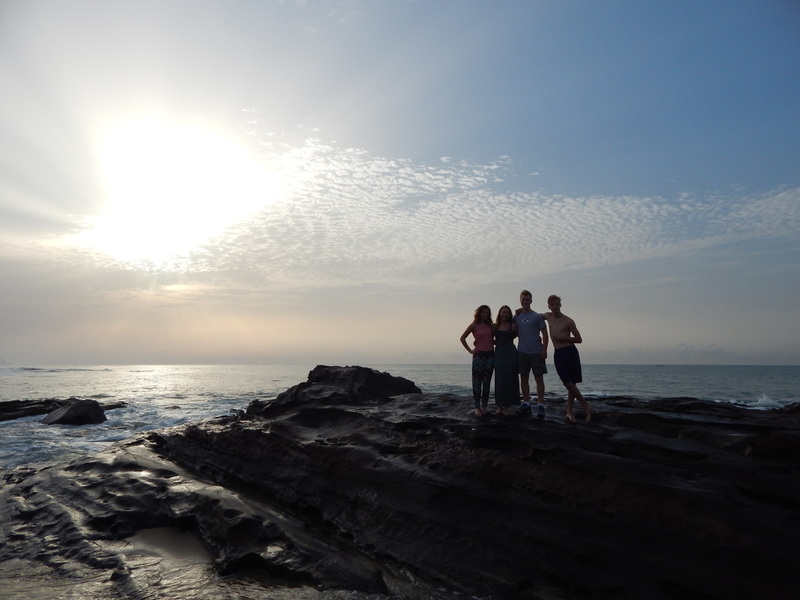 Thanks for an amazing stay! In Kitase, Eastern Region GE students get to spend the entire day at Wisdom Academy, the school that helped create the Project Wisdom program. 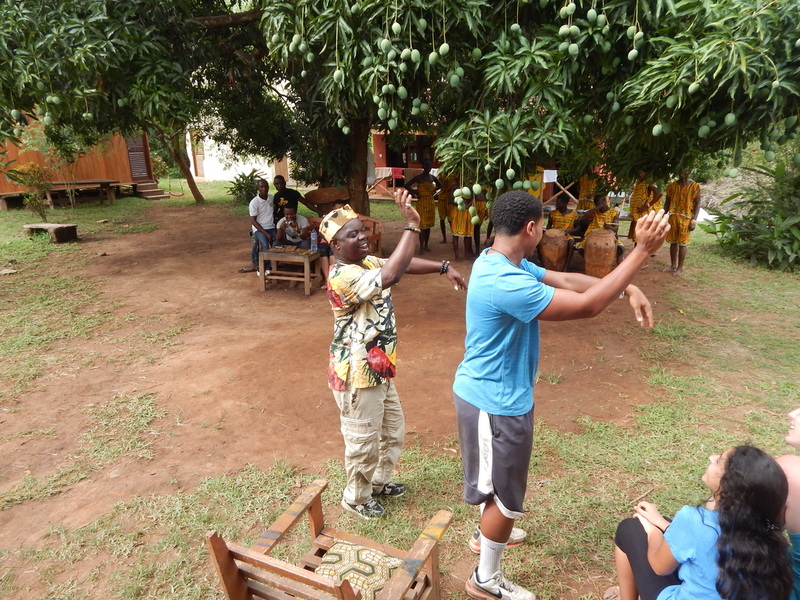 Jill teaches Form 3 students about sign language. Noah teaches Form 5 some advanced math. 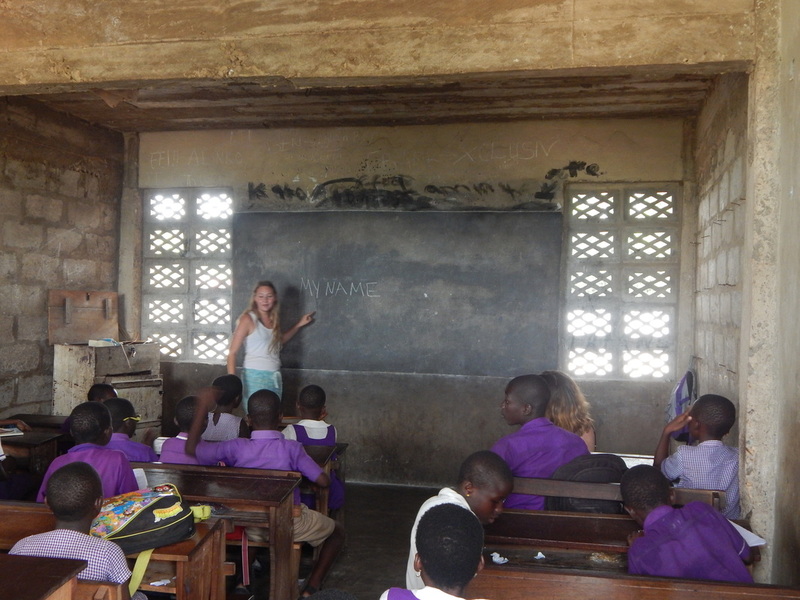 Zoe, Emma, and Ellie teach.....something. 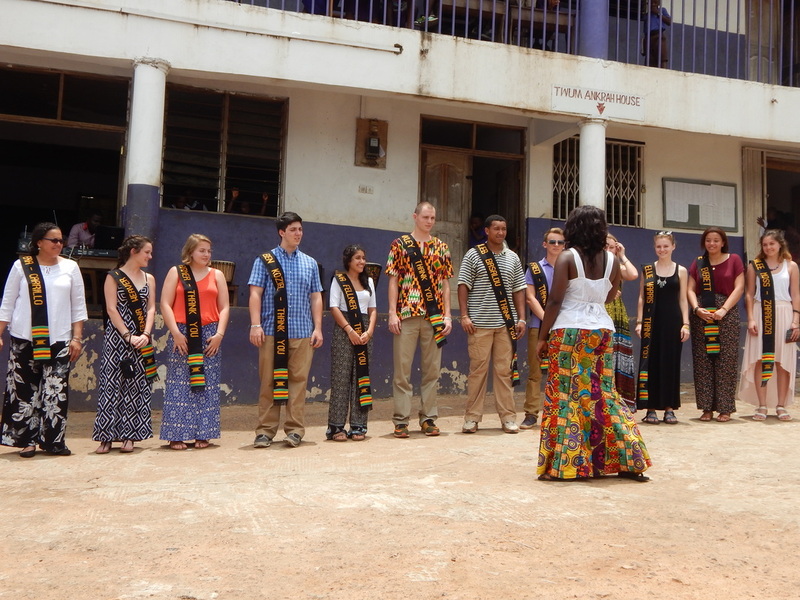 Our final weekday in Ghana is spent watching the amazing performances from the Wisdom Academy students. GE students are then presented with personalized kente cloths as a symbol of their partnership with Wisdom Academy. GE students pose with Wisdom Academy staff after the performances have ended. 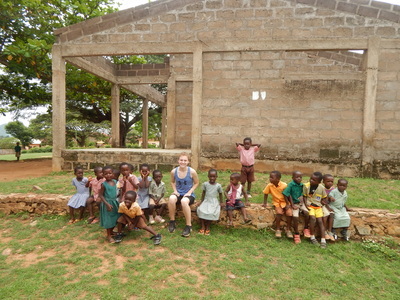 Then they pose with the school. 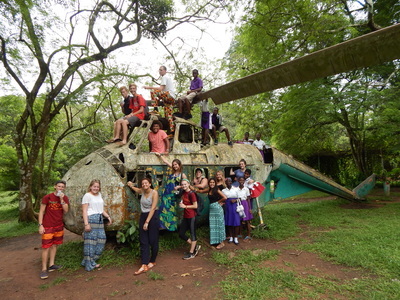 On the last full day in Ghana, GE students take Form 5 students on a field trip to the nearby Aburi Botanical Gardens for a day of fun and relaxing. 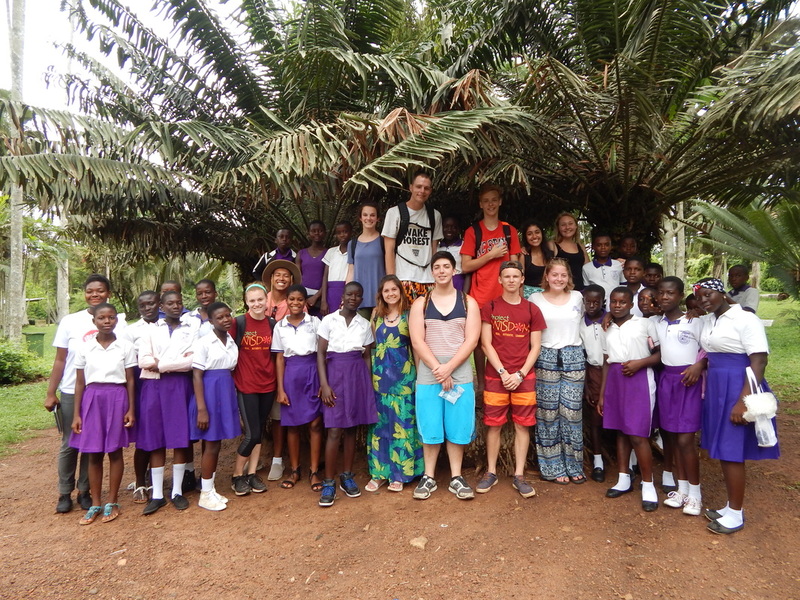 Our final cross-cultural group picture in Ghana! GE students leave Wisdom Academy with early childhood educational supplies collected before the trip. 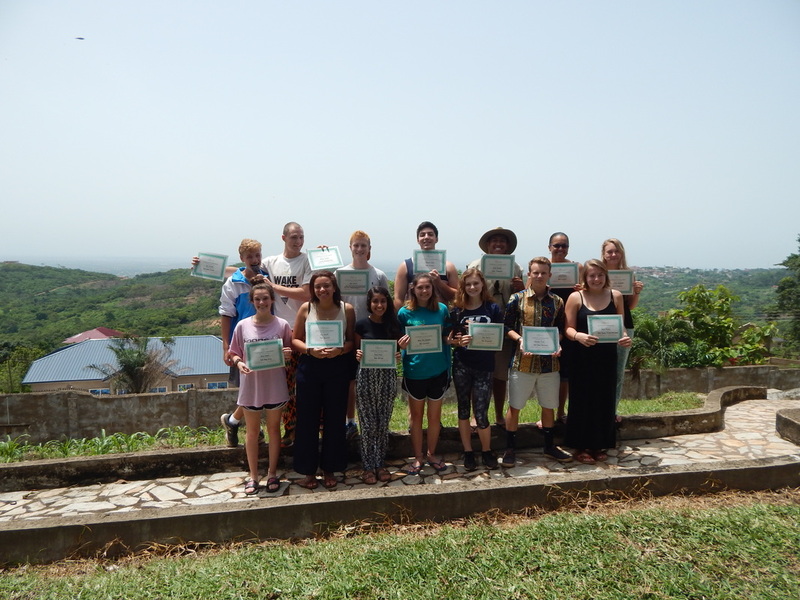 Awards Day! GE students reconvene for one final meeting before leaving the country they have called home for the past two weeks. 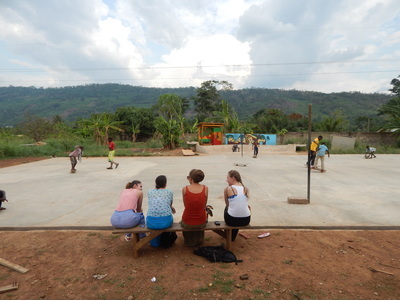 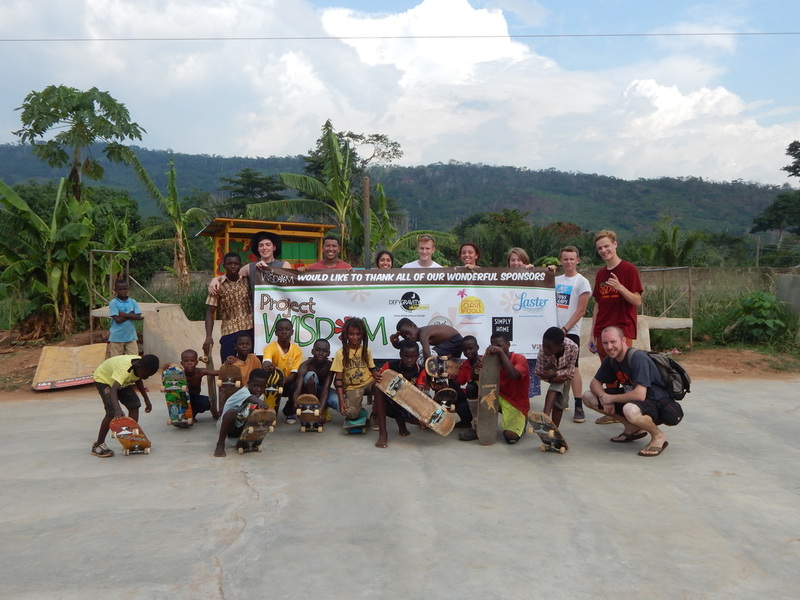 GE students are in Peki, Volta Region and meet up with Roots Yard at the local skate park. 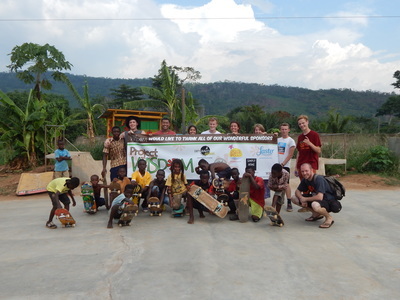 GE students bring new skateboards and skate shoes for the growing number of skaters in the Peki area. 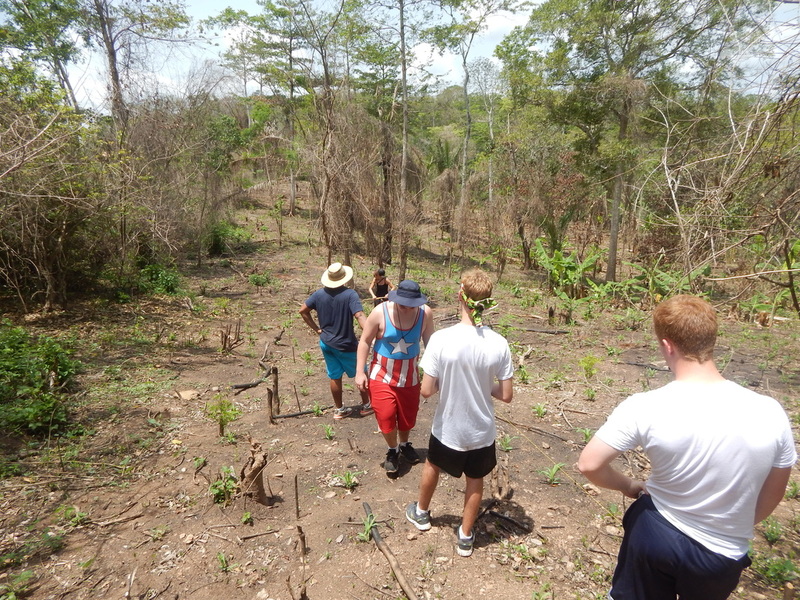 In an act of experiential learning, GE students walk two miles up a small mountain to learn and "feel" what it's like to be a farmer in Ghana. 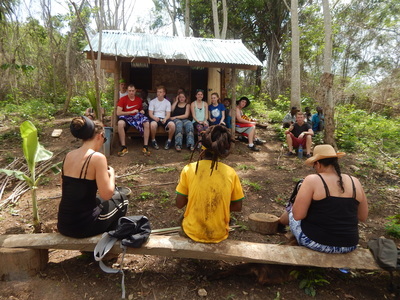 Here they are resting after the walk. 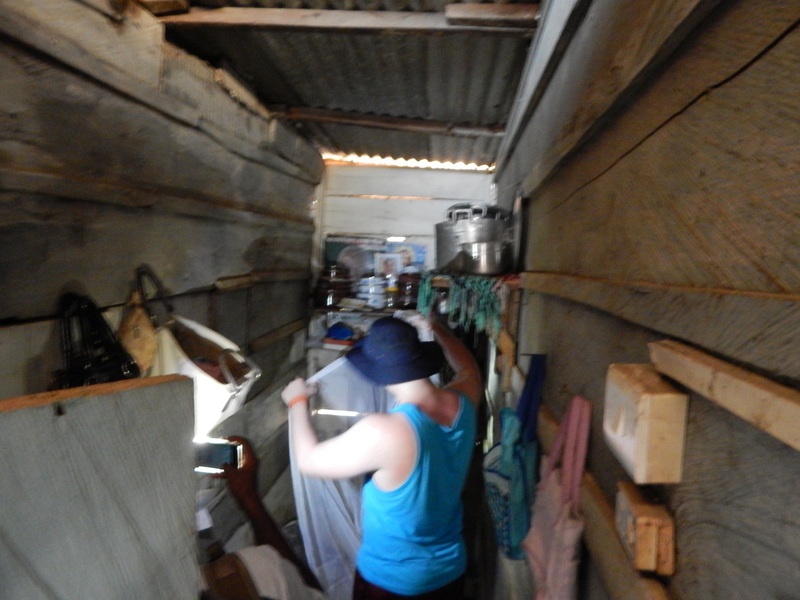 Then it's time to work. Students plant trees along the border of the new farm while learning about agricultural practices and uses in Ghana. Then it's off to the local school to learn about the community development project that they will partner with Roots Yard to complete. 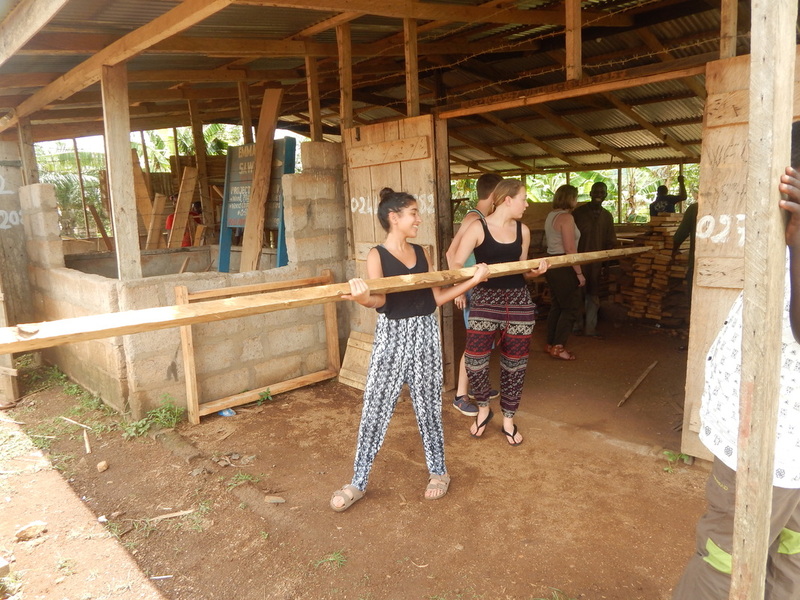 GE students buy lumber from a local lumber yard and transport it to the Roots Yard compound to be treated. 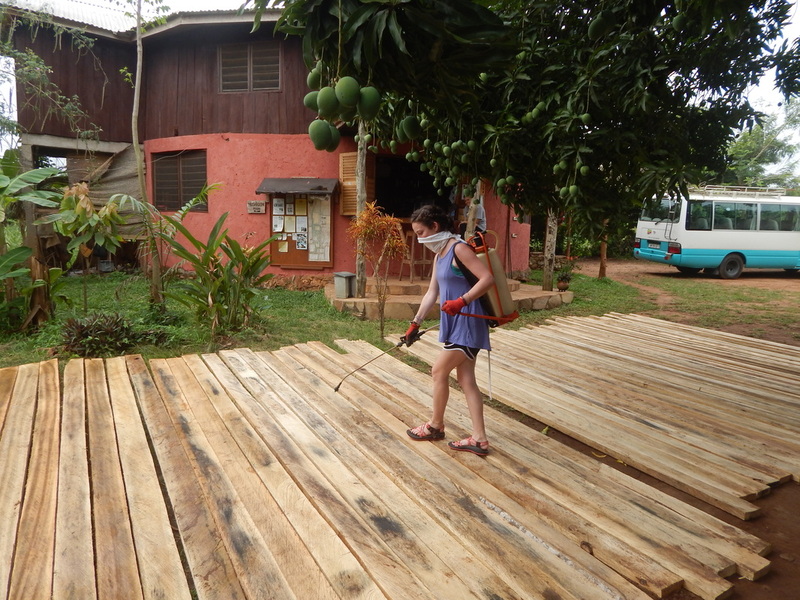 Genna treats the wood with pesticide to ensure that it lasts a long time for the school. 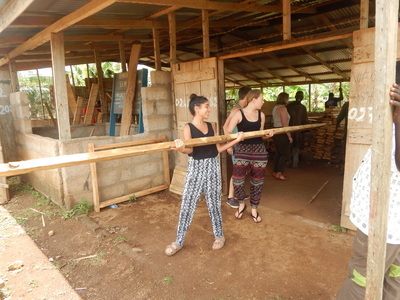 The following day the lumber is transported to the local school. 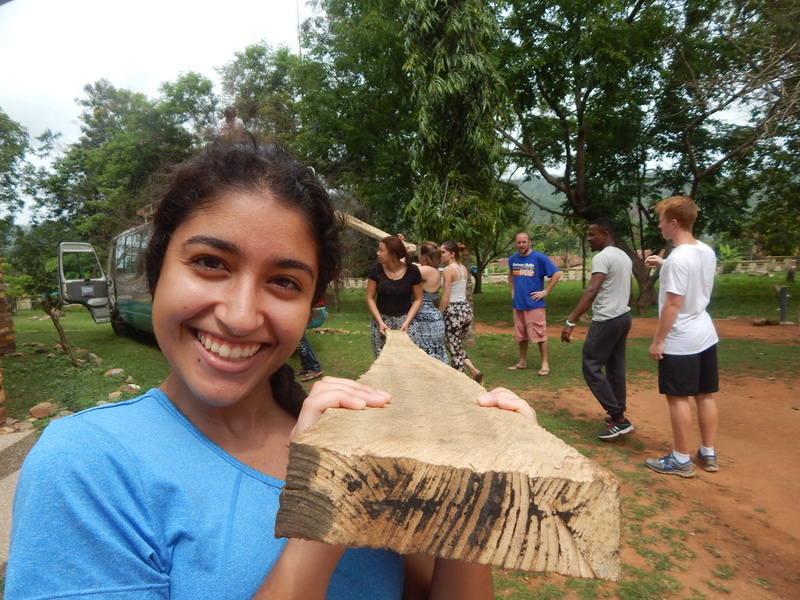 Anuva helps stack the wood outside of the construction site. Local carpenters will be hired to the expert work. 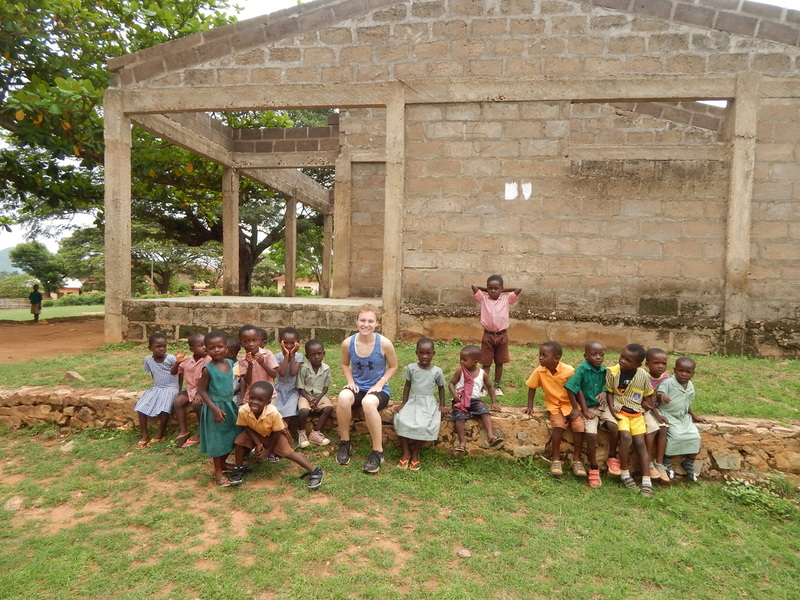 Ellie meets some more friends and poses for a pic. Meanwhile, Ian and Brendan teach a second grade class a familiar educational game in the US - hangman! 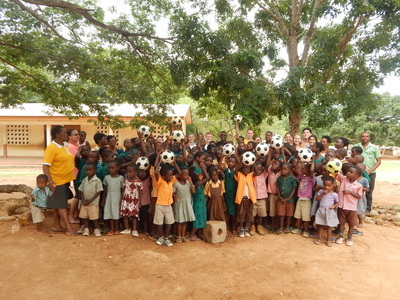 Sports equipment is donated to Peki Primary School. 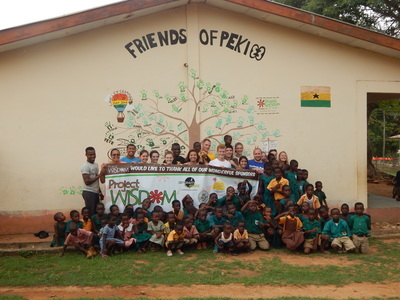 Before leaving the Peki Primary School, GE students pose for a group picture with their new friends. 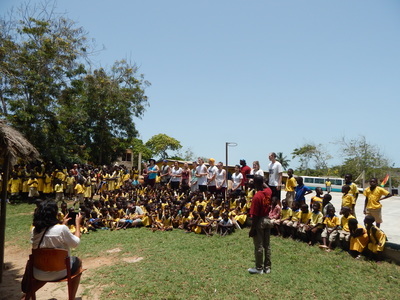 The following day, instead of travelling to a local school, a local school travels to us. 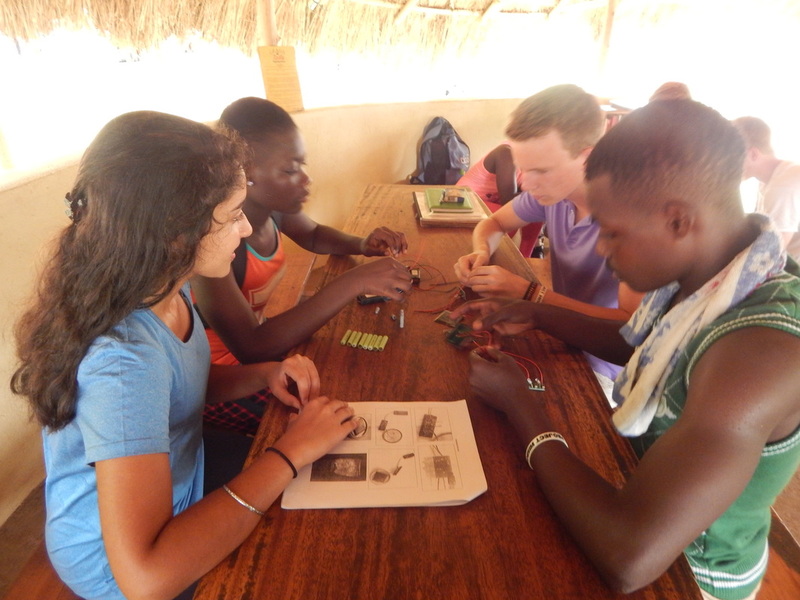 GE students and local high schoolers in Ghana work with solar energy kits to learn about renewable energy. Kailee poses with her new friends and shares some Husky Pride. Mr. Bob teaches GE students about renewable energy through the construction of a wind turbine. 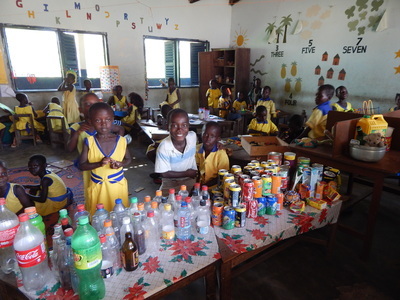 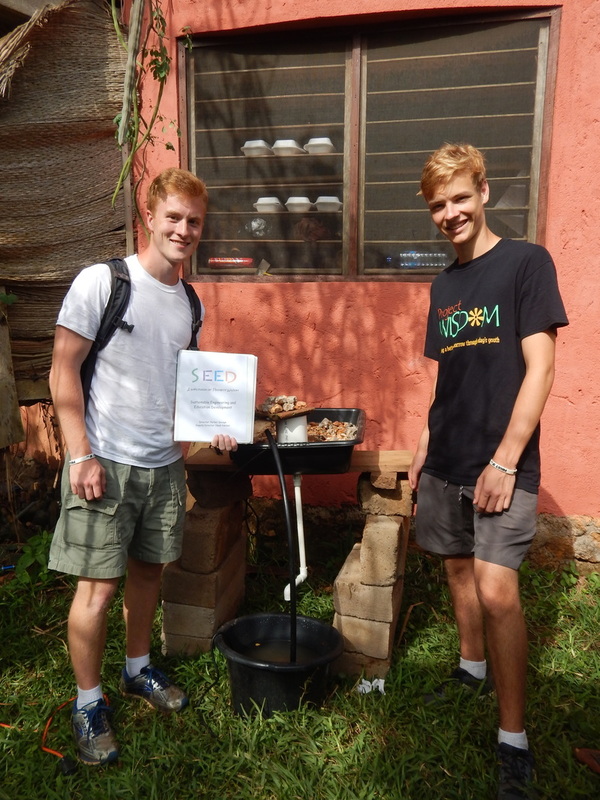 GE students teach local farmers about alternative energy and agricultural practices with their aquaponics fish farm model that they brought with them to Ghana. Students arrive in Cape Coast on their first day in Ghana. Part of their introduction week has students partake in cultural projects like making batik with local artists. 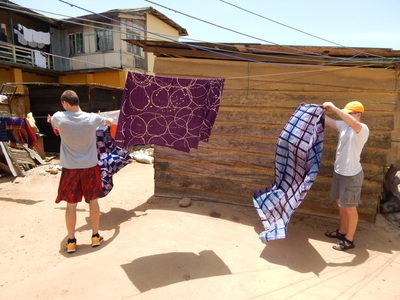 Besides learning about batiking, GE students also learn about the local economy and a really cool NGO, Global Mamas. 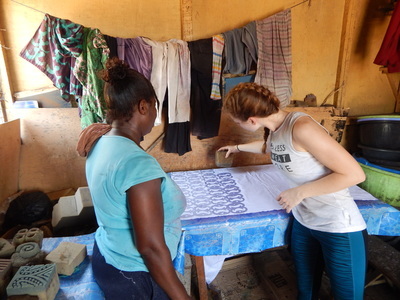 Global Mamas helps support female artisans throughout Ghana and, in doing so, supports local economies and families. 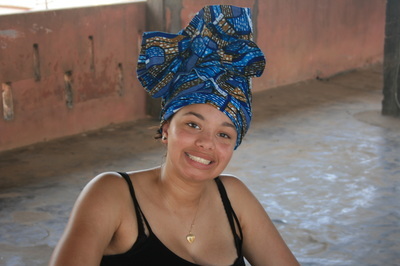 Some students opt to learn about head-wrapping from the Global Mamas women. 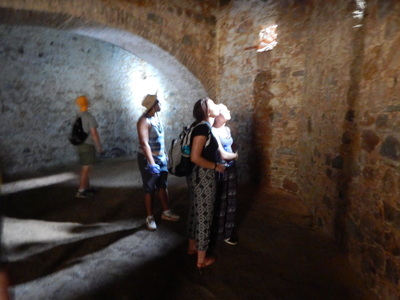 Students visit the Cape Coast Castle, once a holding cell for slaves about to make the trans-Atlantic journey. 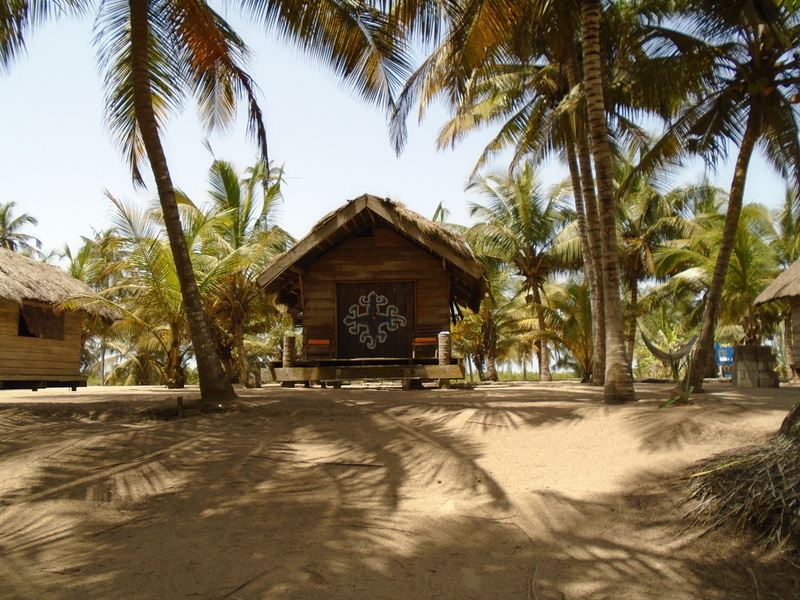 Students reflect on slavery, both past and present during their time in Cape Coast. 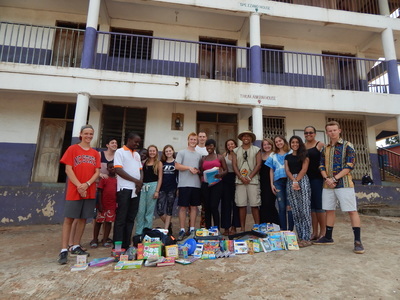 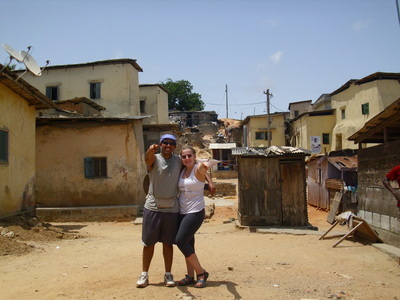 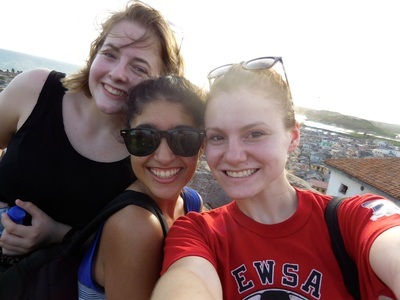 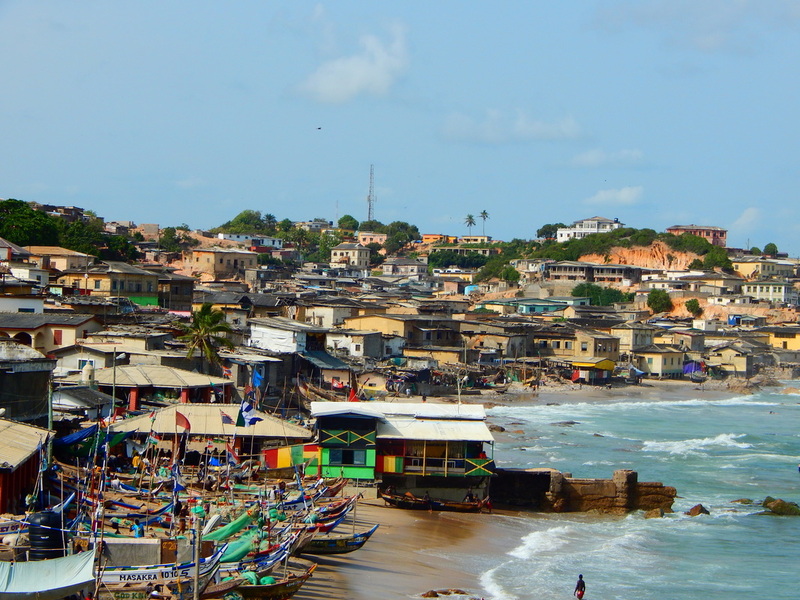 Students visit an underprivileged neighborhood (Amunful) in Cape Coast to see what global poverty looks like, to talk with residents about their struggles, and to help some families. One way the GE students help is with a donation for mosquito nets to a local NGO, Hoops Care. 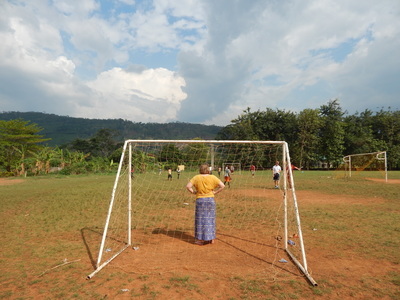 During their time in Amunful, they hang three nets in local homes. 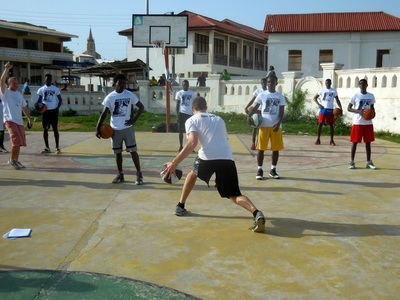 One GE student joins Hoops Care the next day to help with a basketball clinic. 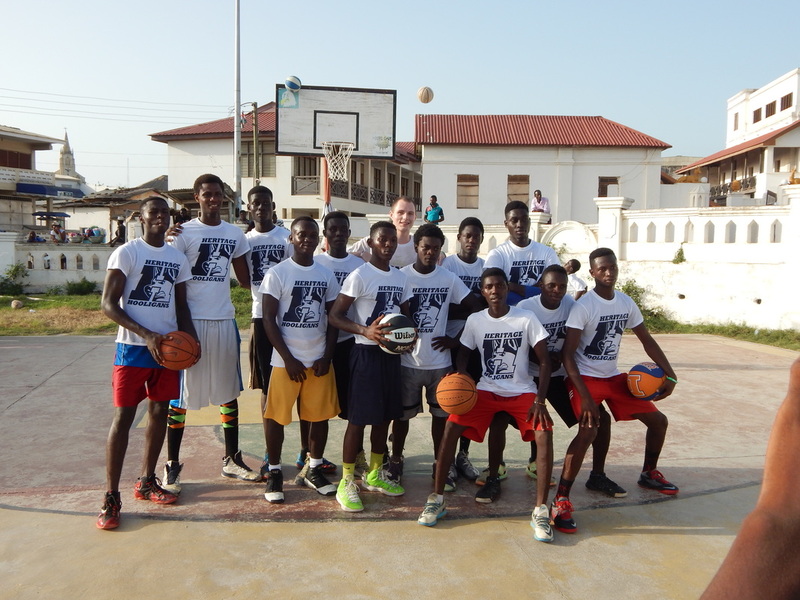 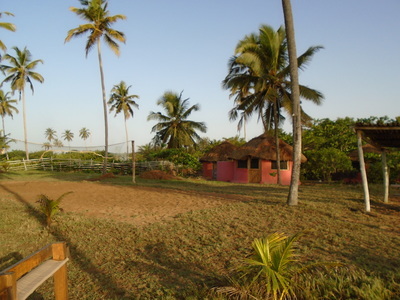 Hoops Care uses sports to improve the lives of children and families in the Cape Coast area. 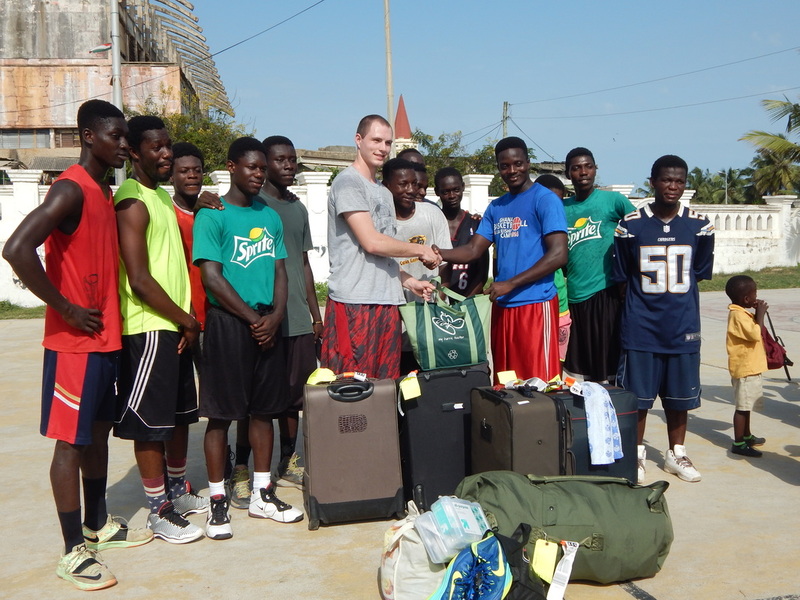 GE students donate sporting equipment during their visit. 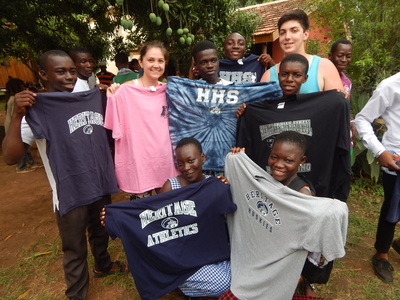 Hoops Care players sport t-shirts from Heritage High School, a gift from the school to the organization. 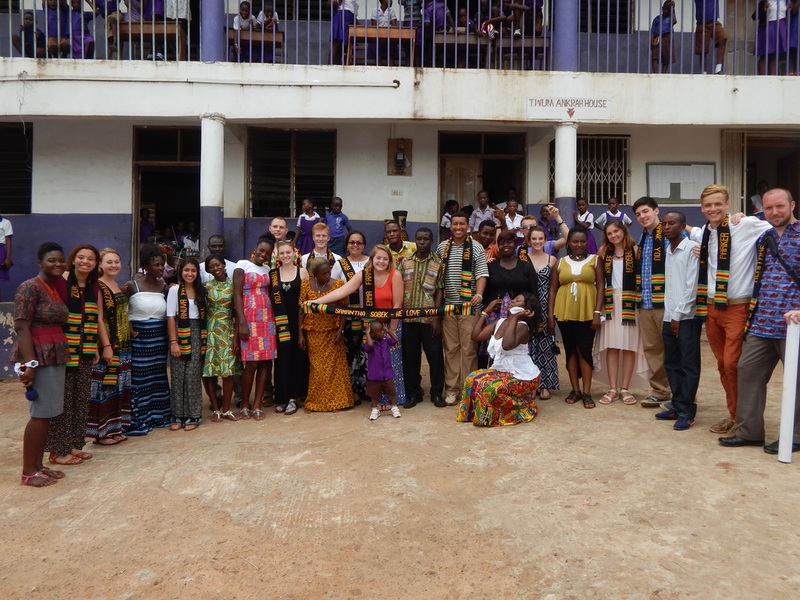 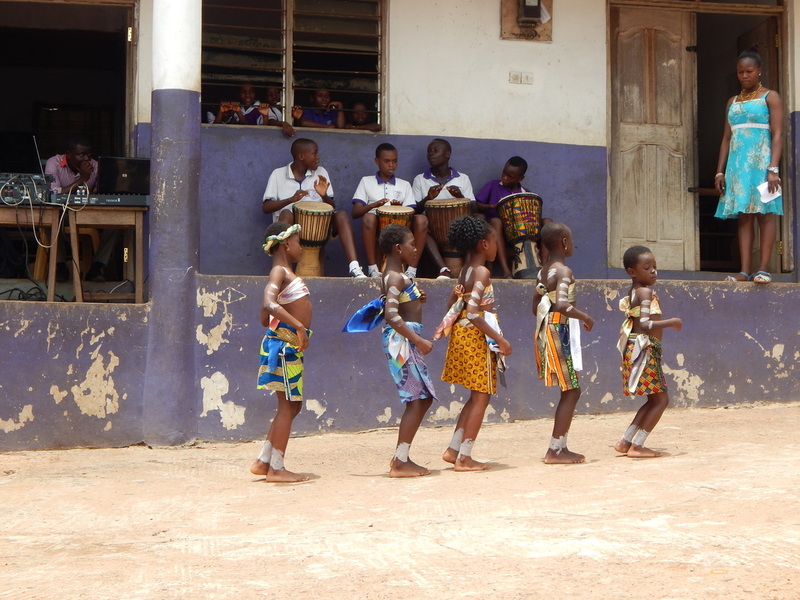 The next day, GE students head to Asaafa to meet with their next Global Partner, One Love Foundation, to learn about education and health in Ghana. 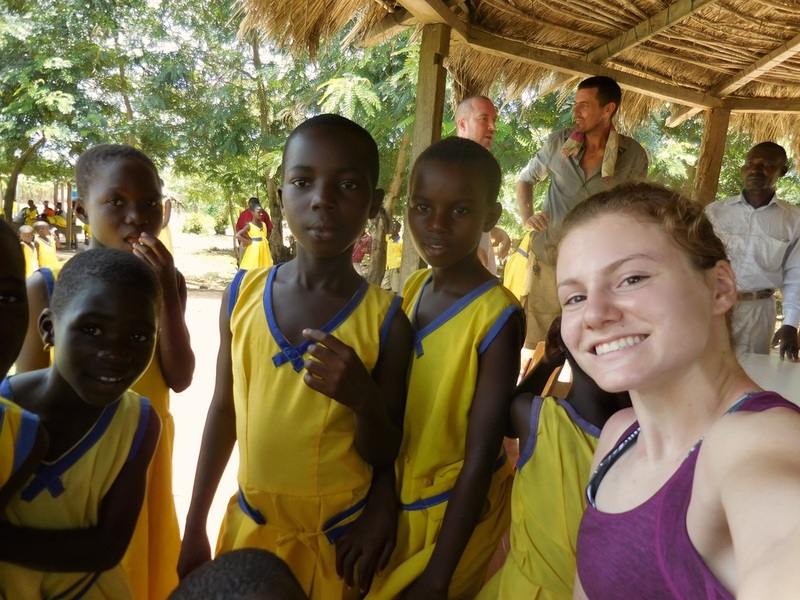 Ellie meets some new friends in Asaafa and poses for a selfie. GE students visit the kindergarten classrooms to learn about an innovative approach to early-childhood education taking place at the Asaafa school. 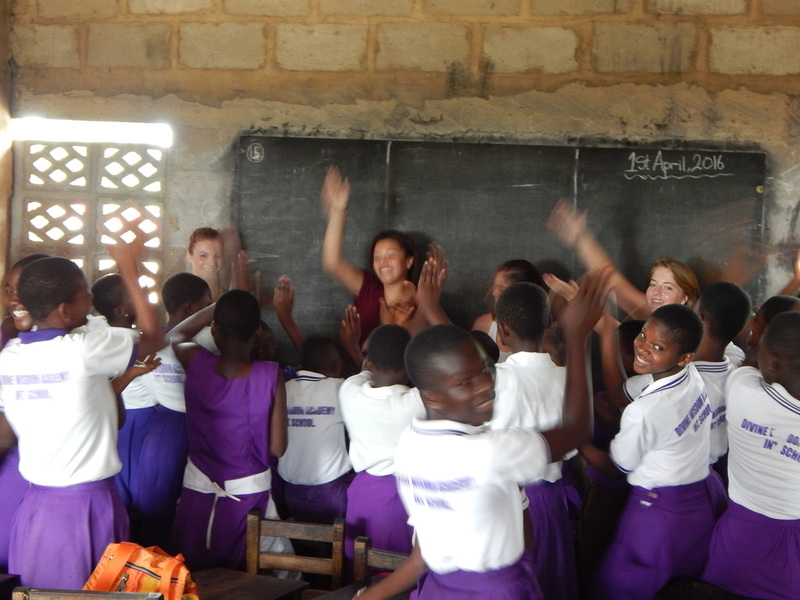 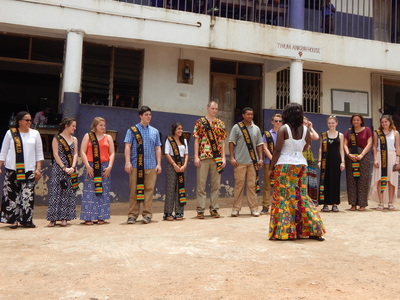 ...and the American students teach the Ghanaian students a new song ("Lean on Me"). 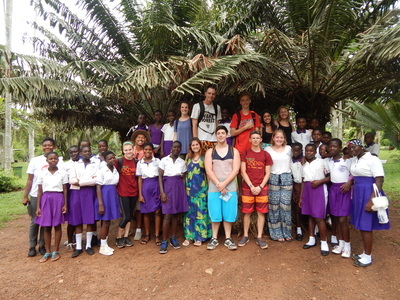 Before taking off, all the students pose for one last giant group picture. Transportation in Ghana is always an adventure! 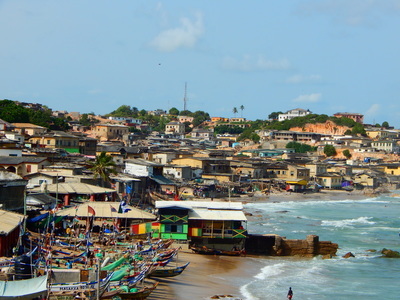 The last stop before leaving the Cape Coast area is with S.A.B.R.E. 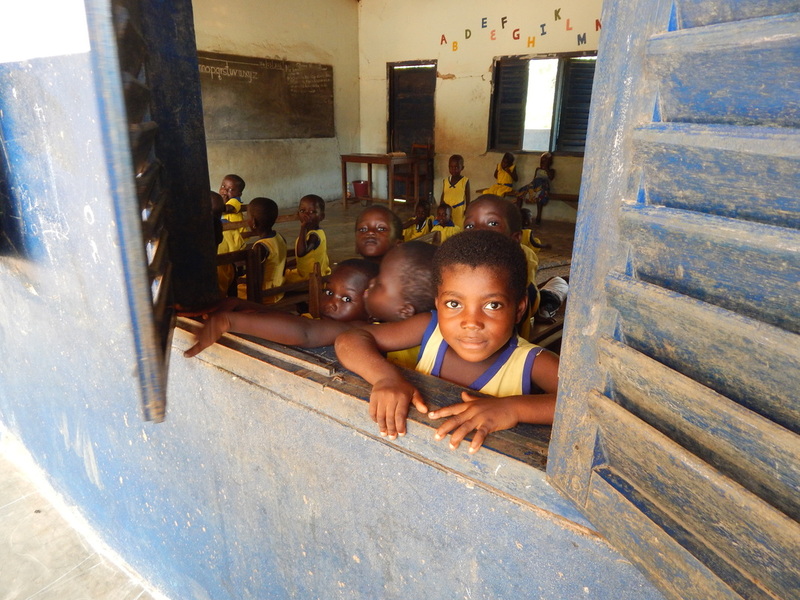 Trust, an amazing organization that is transforming the way young children are taught in Ghana. 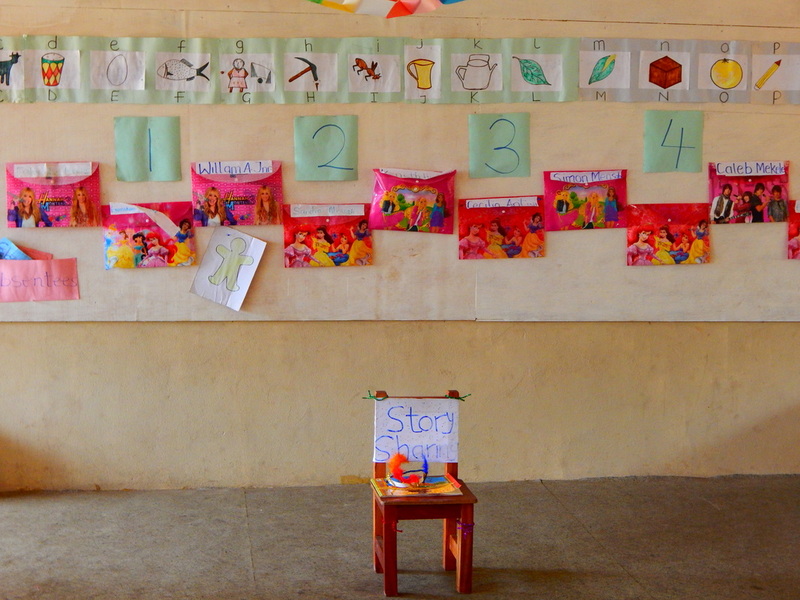 The Story Chair sits front and center in a S.A.B.R.E. 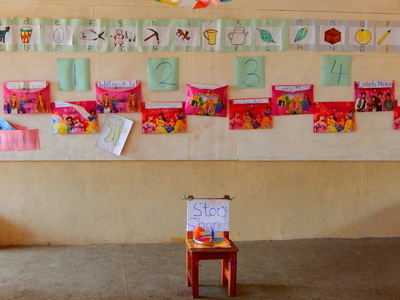 kindergarten classroom. 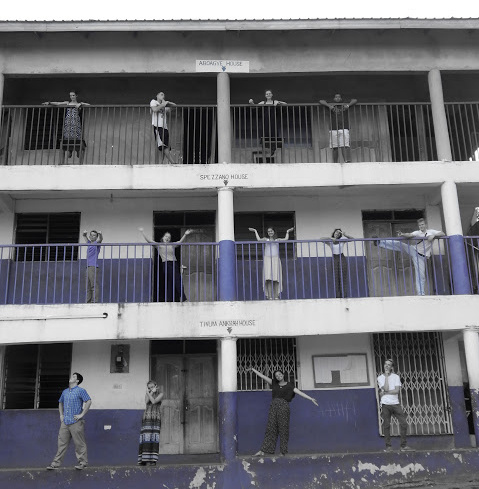 In March of 2016, thirteen students left the comfortable confines of their American high school existence for the unfamiliarity of Ghana, West Africa. Explore the galleries below to see what happened during their unforgettable trip. Rollover the images to read the captions and learn more about Operation Wisdom's unique youth travel program, Global Expeditions. 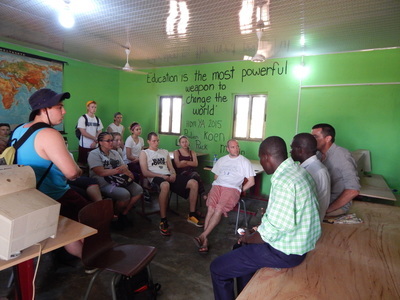 The middle part of the trip was spent at Roots Yard in Peki, Ghana. 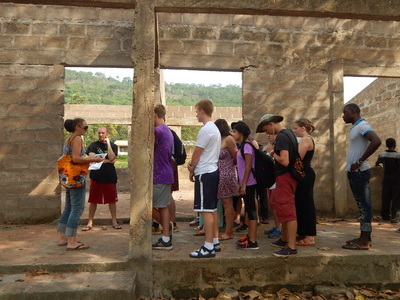 Here the focus was on community development, experiential learning, and discovering the "power of one." 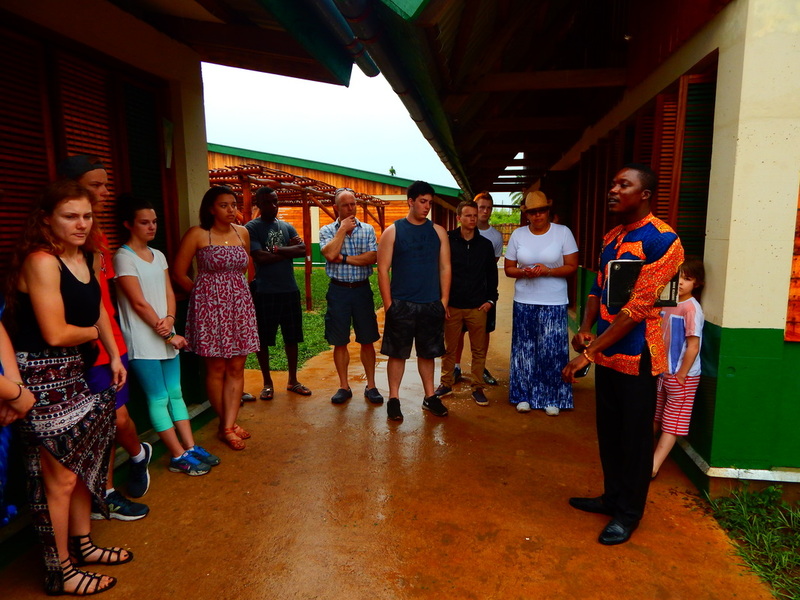 Among other things, Operation Wisdom students participated in community service at a local primary school, learned what it's like to be a Ghanaian farmer, and collaborated with a local high school to learn about renewable energy. The trip ended in the same place that the program began nearly a decade ago - Kitase, Eastern Region - at Wisdom Academy. 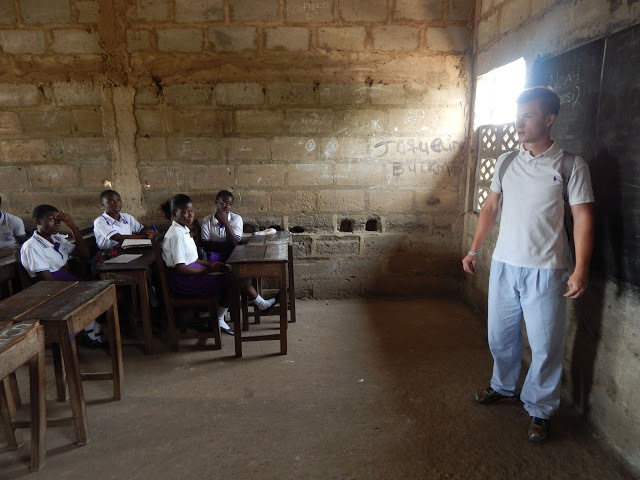 The focus in Kitase was on education and reflection. Students got an opportunity to visit classrooms, teach prepared lessons, and take some of the students on a field trip. 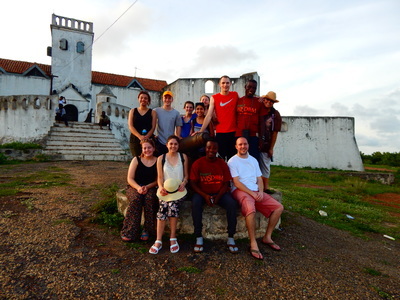 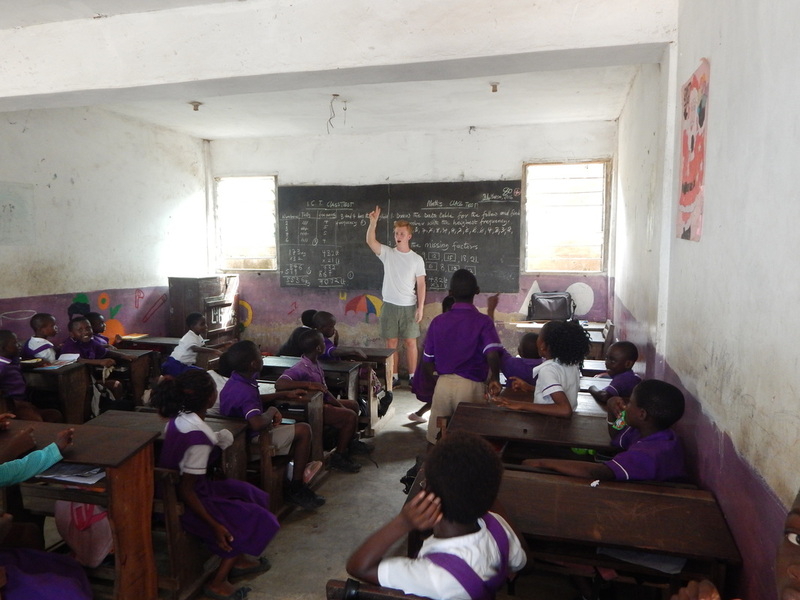 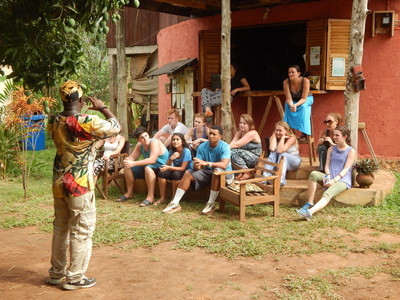 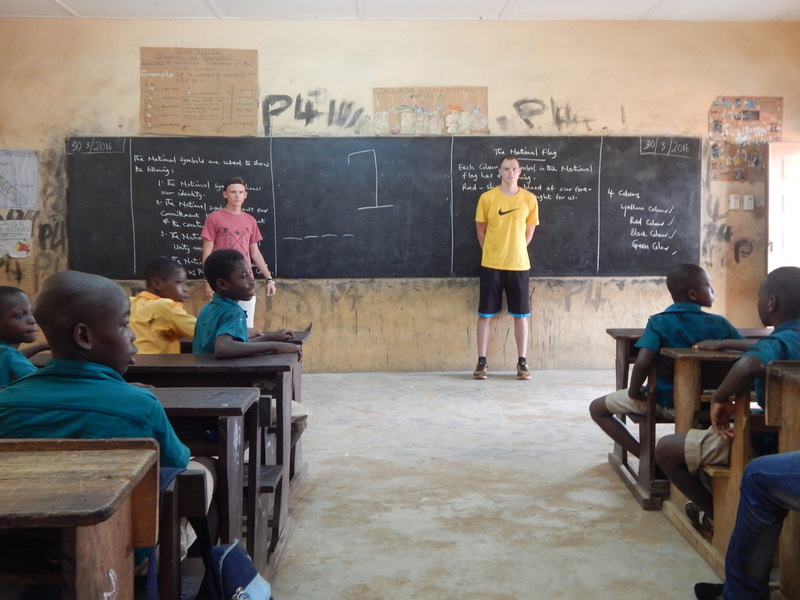 Most importantly, however, students began planning what they would do with the knowledge and connections established during their 15 days in Ghana. In between serving and learning, students found time for some leisurely pursuits. Check out the best-of-the-best from the 2016 Global Expedition photo album below. 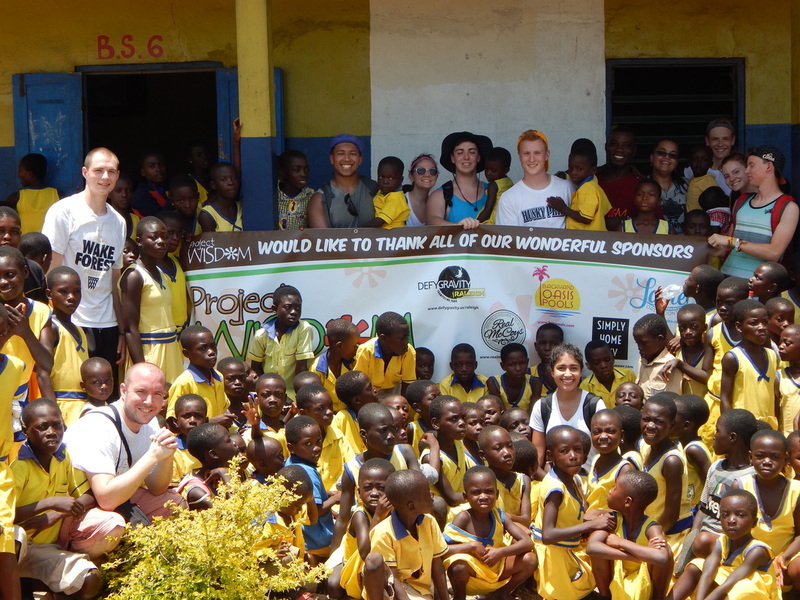 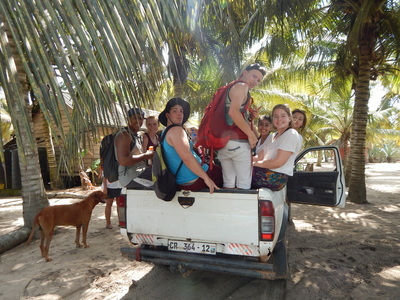 Like many youth travel programs, Operation Wisdom's Global Expeditions are labelled as service-learning trips. Unlike many youth travel programs, however, the service does not truly begin until students are back home. It is there, where familiarity and resources abound, that students are able to use their new-found knowledge and their global connections to make a difference in a way that is beneficial to everyone - themselves, the host country, and the global partners.